Every sport fisherman dreams of catching “the big one,” a world-record lunker that will get his or her name forever etched in the annals of fishing history. Of course, most of us understand we’ll never realize this dream, and would instead be perfectly content to set a new personal best every couple of years. 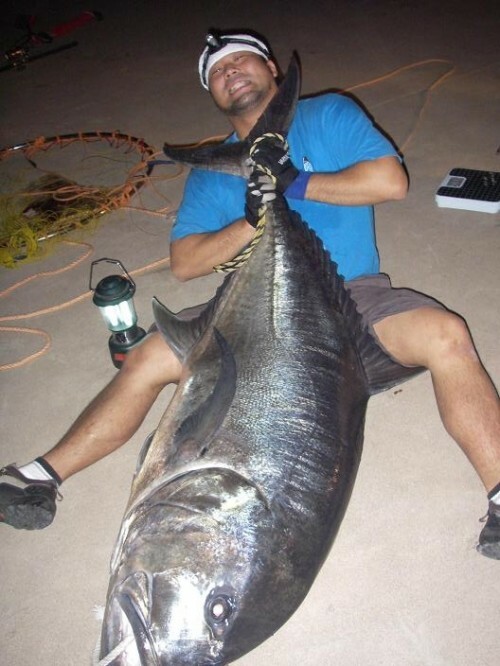 But there are people who have lived the dream—people who have landed monster fish certified by the International Game Fish Association as world records. 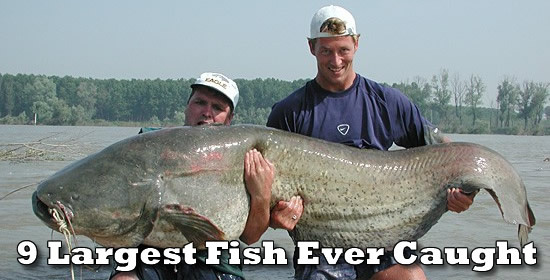 So, to inspire anglers everywhere and keep dreams alive, here are 9 of the largest fish ever caught (by species). 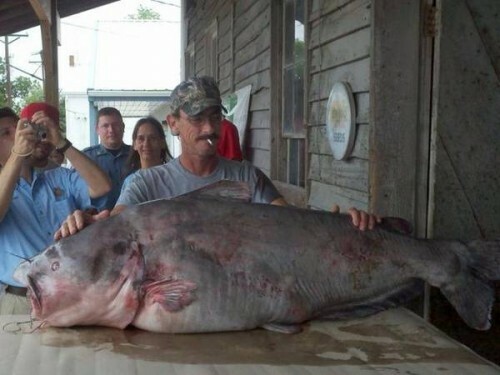 This world record blue catfish (Ictalurus furcatus) was landed by 47-year-old Missouri resident Greg Bernal at 1:30 A.M. on July 21, 2010. He caught the beast with rod and reel in the Missouri River. At 57 inches long, 45 inches in girth, and a whopping 130 pounds, the fish beats five-year-old previous world record—also caught in Missouri—by a solid 6 pounds. Keiki Hamasaki of Kagoshima, Japan caught this 160 lb. 7 oz. giant grevally (Caranx ignoblis) not far from his hometown on May 22, 2006. Casting a lure from the shore on a 130-pound test line, it took him 35 minutes to hall the fish in. It beat the previous record, set by Russel Mori, by 25 pounds. The giant tigerfish (Hydrocynus goliath), found in rivers throughout central Africa, is famous (and almost certainly named) for its giant teeth. These teeth can take a chunk out of just about anything, including human limbs, so fishing for these things can be quite hazardous to one’s health. 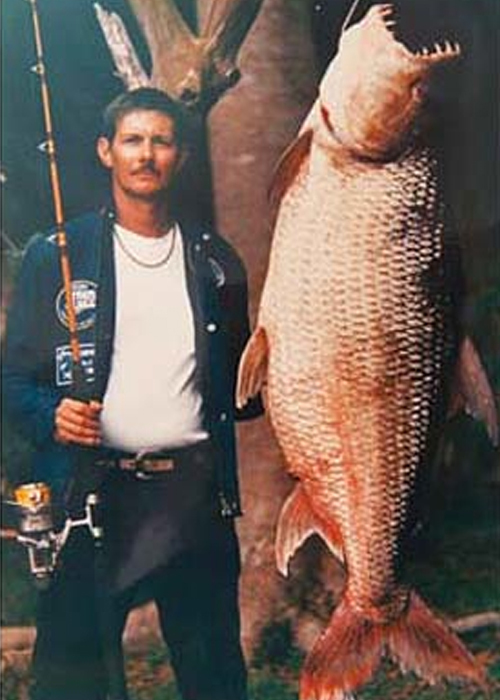 The world record giant tigerfish, caught on rod and real and pictured here, was landed on July 9, 1988 by Raymond Houtmans. It weighed a whopping 97 pounds. The absolutely terrifying Alligator Gar (Atractosteus spatula) is typically found in the Southeastern portion of the United States, but they have been seen as far north as Illinois and as far south as Veracruz, Mexico. 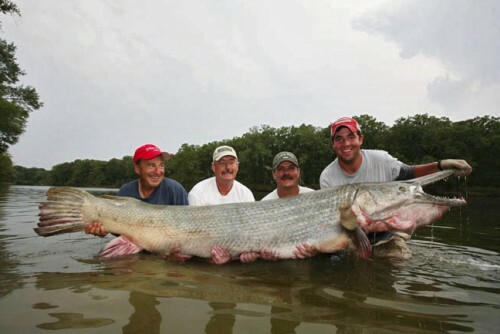 Historically despised because they feed on prized game fish like largemouth bass—and because they are scary as hell—recently there has been a surge in “Gar hunting.” The one pictured here, for example, may be the world record for Alligator Gar killed by bow and arrow. It was shot in Texas by John Paul Morris, the son of Bass Pro Shops CEO Johnny Morris. The beast measured 8’3” and weighed 230 pounds! In North America, the largemouth bass (Micropterus salmonides) record is considered the “holy grail” of freshwater fishing records. This is primarily due to two factors. First, largemouth bass are among the most sought-after game fish, and bass fishing is a billion dollar industry. Second, the world record for largemouth bass is one of the oldest and most revered in the world, having stood for an incredible 77 years. And while this hallowed record has not yet fallen, it has been tied. 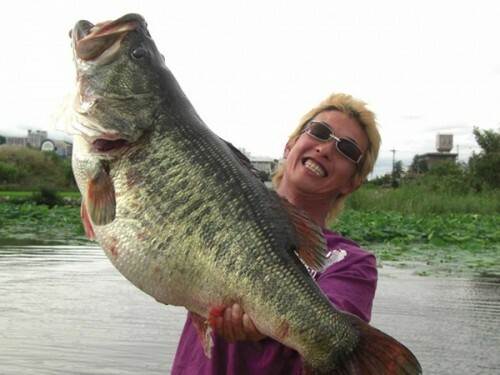 Manabu Kurita of Aichi, Japan caught a 22 lb. 4 oz. bass on July 2, 2009 in Lake Biwa near Kyoto, tying the record set by George Perry of Jacksonville, Georgia on June 2, 1932. 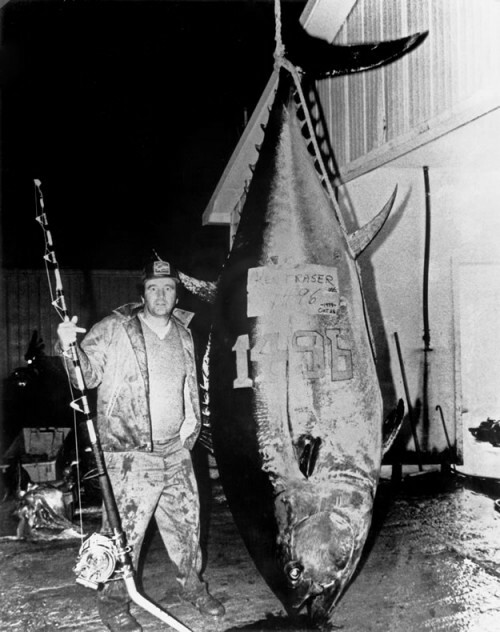 There was much debate and quite a bit of controversy surrounding this record-setting catch, given the sanctity of the record involved, but the International Game Fish Association went to great lengths to verify the record—even subjecting Mr. Kurita to a polygraph test, which he passed. So, the record is officially tied. 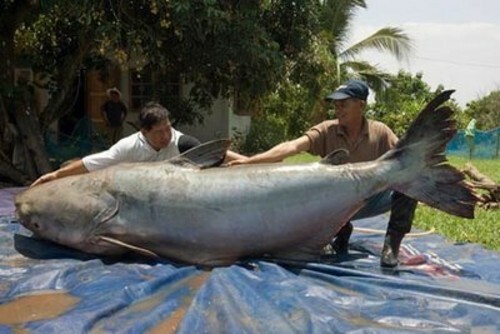 On May 1, 2005 Fishermen in northern Thailand netted what scientists believe is the largest freshwater fish ever recorded, let alone caught. At 9 feet long and 646 pounds, the Mekong giant catfish (Pangasianodon gigas) was the size of an adult grizzly bear. Since this species of fish is considered critically endangered, the fishermen tried their best to keep the brute alive, but were unsuccessful. It was later eaten by local villagers. 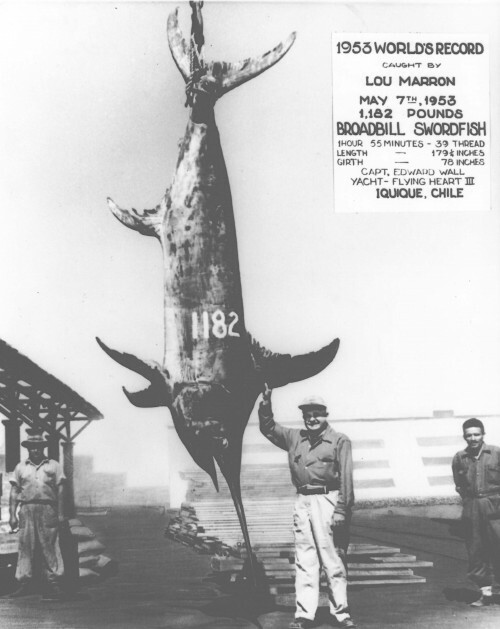 The swordfish (Xiphias gladius) world record was set all the way back on May 7, 1953 off the coast of Iquique, Chile, by Lou Marron. The fish Marron landed after a grueling 2-hour fight was 179.25 inches long and weighed 1,182 pounds. It was one of the heaviest fish ever caught on rod and reel. Today, the restored mount of the fish is on display at the International Game Fish Association Fishing Hall of Fame & Museum in Miami, FL. The record for Atlantic Blue Marlin (Makaira nigricans) has the distinction of being set on a Leap Day. 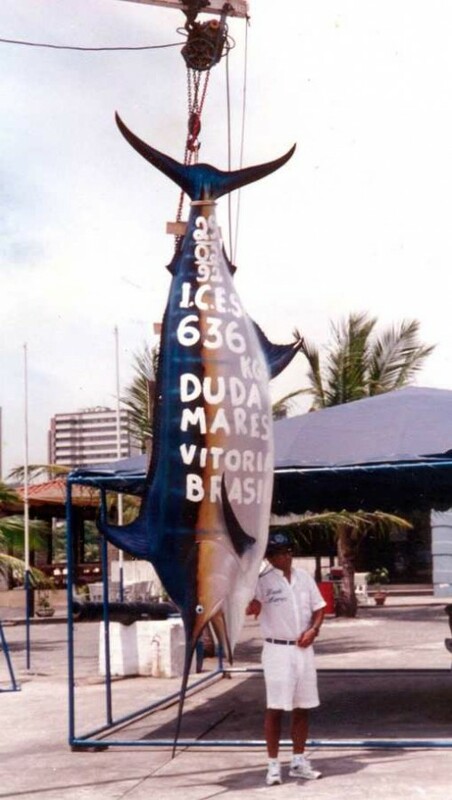 On Feburary 29, 1992, after an 80 minute battle, Paulo Amorim landed a whopper off the coast of Vitória, Brazil that weighed in at 1,402 pounds. This beat the old record by an impressive 120 pounds. I recently recieved all of the Bailey [url=http://www.d3kiss.com/]diablo 3 gold[/url] available for Party due to my better half & I'm sure these people! They are extremely great & trendy. I hoped for a couple to get with the my best quite short skinny jeans & they could be appropriate. Merely organized their brushing guide in order to give them prepared for ones outside the house. Someone said located on the description this games gold carries on a specifications larger sized however for anyone they begin to came true to magnitude. Once more ,...Terrific games gold! Interesting however they chance a measurements too big. I primarily required my valid capacity together to come back games gold for a measurement scaled-down additionally they were Excellent! I got those with regard to originality, and were definitely best the original Nights, and then these people began to bring out and search poor. It doesn't have a very good tough joints for instance the many other antique [url=http://www.d3boy.com/]d3 gold[/url], in order that the factors lemon and even wrinkles manner.